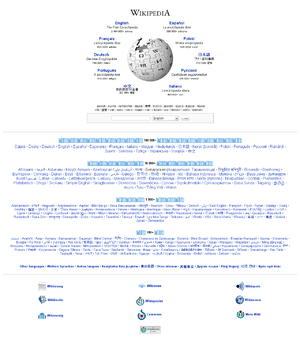 This page is an introduction for visitors to the Wikipedia project. There is also an encyclopedia article about the topic: Wikipedia. Wikipedia (pronounced /ˌwiːkiˈpiːdiə/ or /ˌwɪkəˈpiːdiə/) is a multilingual, Web-based, free-content encyclopedia project. The name "Wikipedia" is a portmanteau (a combination of portions of two words and their meanings) of the words wiki (a type of collaborative Web site) and encyclopedia. Wikipedia's articles provide links to guide the user to related pages with additional information. Wikipedia is written collaboratively by volunteers from all around the world; anyone can edit it. Since its creation in 2001, Wikipedia has grown rapidly into one of the largest reference Web sites, attracting at least 684 million visitors yearly by 2008. There are more than 75,000 active contributors working on more than 10,000,000 articles in more than 260 languages. As of today, there are 2,712,592 articles in English. Every day, hundreds of thousands of visitors from around the world collectively make tens of thousands of edits and create thousands of new articles to augment the knowledge held by the Wikipedia encyclopedia. (See also: Wikipedia:Statistics). Visitors do not need specialized qualifications to contribute, since their primary role is to write articles that cover existing knowledge. This means that people of all ages and cultural and social backgrounds can write Wikipedia articles. Most of the articles can be edited by anyone with access to the Internet, simply by clicking the edit this page link. Anyone is welcome to add information, cross-references, or citations, as long as they do so within Wikipedia's editing policies and to an appropriate standard. Substandard or disputed information is subject to removal. Users need not worry about accidentally damaging Wikipedia when adding or improving information, as other editors are always around to advise or correct obvious errors, and Wikipedia's software is carefully designed to allow easy reversal of editorial mistakes. Because Wikipedia is an ongoing work to which, in principle, anybody can contribute, it differs from a paper-based reference source in important ways. In particular, older articles tend to be more comprehensive and balanced, while newer articles more frequently contain significant misinformation, unencyclopedic content, or vandalism. Users need to be aware of this to obtain valid information and avoid misinformation that has been recently added and not yet removed (see Researching with Wikipedia for more details). However, unlike a paper reference source, Wikipedia is continually updated, with the creation or updating of articles on topical events within seconds, minutes, or hours, rather than months or years for printed encyclopedias. If you have not done so, we invite you to take a few moments to read What Wikipedia is (and is not), so that you have an understanding of how to consult or contribute to Wikipedia. Further information on key topics appears below. If you cannot find what you are looking for, try the Frequently asked questions, advice for parents, or see Where to ask questions. For help with editing and other issues, see Help:Contents. Wikipedia was founded as an offshoot of Nupedia, a now-abandoned project to produce a free encyclopedia. Nupedia had an elaborate system of peer review and required highly qualified contributors, but the writing of articles was slow. During 2000, Jimmy Wales, founder of Nupedia, and Larry Sanger, whom Wales had employed to work on the project, discussed ways of supplementing Nupedia with a more open, complementary project. Multiple sources are suggested for the idea that a wiki might allow members of the public to contribute material, and Nupedia's first wiki went online on January 10. There was considerable resistance on the part of Nupedia's editors and reviewers to the idea of associating Nupedia with a Web site in the wiki format, so the new project was given the name "Wikipedia" and launched on its own domain, wikipedia.com, on January 15 (now called "Wikipedia Day" by some users). The bandwidth and server (in San Diego) were donated by Wales. Other current and past Bomis employees who have worked on the project include Tim Shell, one of the cofounders of Bomis and its current CEO, and programmer Jason Richey. The domain was eventually changed to the present wikipedia.org when the not-for-profit Wikimedia Foundation was launched as its new parent organization, prompting the use of a ".org" domain to denote its non-commercial nature. In March 2007, the word wiki became a newly-recognized English word. In May 2001, a wave of non-English Wikipedias was launched — in Catalan, Chinese, Dutch, Esperanto, French, German, Hebrew, Italian, Japanese, Portuguese, Russian, Spanish, and Swedish. These were soon joined by Arabic and Hungarian. In September, Polish was added, and further commitment to the multilingual provision of Wikipedia was made. At the end of the year, Afrikaans, Norwegian, and Serbocroatian versions were announced. Wikipedia is a registered trademark of the not-for-profit Wikimedia Foundation, which has created an entire family of free-content projects. On all of these projects, you are welcome to be bold and edit articles yourself, contributing knowledge as you see fit in a collaborative way. Anyone with Web access can edit Wikipedia, and this openness encourages inclusion of a tremendous amount of content. About 75,000 editors — from expert scholars to casual readers — regularly edit Wikipedia, and these experienced editors often help to create a consistent style throughout the encyclopedia, following our Manual of Style. Several mechanisms are in place to help Wikipedia members carry out the important work of crafting a high-quality resource while maintaining civility. Editors are able to watch pages and techies can write editing programs to keep track of or rectify bad edits. Over 1,500 administrators with special powers ensure that behaviour conforms to Wikipedia guidelines and policies. Where there are disagreements on how to present facts, editors work together to arrive at an article that fairly represents current expert opinion on the subject. The administrators can temporarily or permanently ban editors of Wikipedia who fail to work with others in a civil manner. Many visitors come to this site to acquire knowledge, others to share knowledge. In fact, at this very instant, dozens of articles are being improved, and new articles are also being created. You can view changes as they happen at the Recent changes page. You also can view random articles. Over 2,000 articles have been designated by the Wikipedia community as featured articles, exemplifying the best articles in Wikipedia. Another 5,000 articles are designated as good articles. Some information on Wikipedia is organized into lists; the best of these are designated as featured lists. Wikipedia also has portals, which organize content around topic areas. You may also search for articles using the search box on the left side of the screen. You also might enjoy reading Wikipedia in other languages. Wikipedia has more than two hundred different languages (see other language versions), including a Simple English version, and related projects include a dictionary, quotations, books, manuals, and scientific reference sources, and a news service (see sister projects). All of these are maintained, updated, and managed by separate communities, and often include thought-provoking information and articles that can be hard to find through other common sources. Users should be aware that not all articles are of encyclopedic quality from the start: they may contain false or debatable information. Indeed, many articles start their lives as partisan; and, after a long process of discussion, debate, and argument, they gradually take on a neutral point of view reached through consensus. Others may, for a while, become caught up in a heavily unbalanced viewpoint which can take some time — months perhaps — to achieve better balanced coverage of their subject. In part, this is because editors often contribute content in which they have a particular interest and do not attempt to make each article that they edit comprehensive. However, eventually, additional editors expand and contribute to articles and strive to achieve balance and comprehensive coverage. In addition, Wikipedia operates a number of internal resolution processes that can assist when editors disagree on content and approach. Usually, the editors eventually reach a consensus on ways to improve the article. While the overall trend is toward improvement, it is important to use Wikipedia carefully if it is intended to be used as a research source, since individual articles will, by their nature, vary in quality and maturity. Available are guidelines and information pages designed to help users and researchers do this effectively, as is an article that summarizes third-party studies and assessments of the reliability of Wikipedia. Wikipedia has advantages over traditional paper encyclopedias. Wikipedia has a very low "publishing" cost for adding or expanding entries and a low environmental impact, since it need never be printed. In addition, Wikipedia has wikilinks instead of in-line explanations and it incorporates overview summaries (article introductions) with the extensive detail of a full article. Additionally, the editorial cycle is short. A paper encyclopedia stays the same until the next edition, whereas writers update Wikipedia at every instant, around the clock, ensuring that it stays abreast of the most recent events and scholarship. Allowing anyone to edit. Wikipedia means that it is more easily vandalized or susceptible to unchecked information, which requires removal. While blatant vandalism is usually easily spotted and rapidly corrected, Wikipedia is more subject to subtle viewpoint promotion than a typical reference work. However, bias that would be unchallenged in a traditional reference work is likely to be ultimately challenged or considered on Wikipedia. While Wikipedia articles generally attain a good standard after editing, it is important to note that fledgling articles and those monitored less well may be susceptible to vandalism and insertion of false information. Wikipedia's radical openness also means that any given article may be, at any given moment, in a bad state, such as in the middle of a large edit, or a controversial rewrite. Many contributors do not yet comply fully with key policies, or may add information without citable sources. Wikipedia's open approach tremendously increases the chances that any particular factual error or misleading statement will be relatively promptly corrected. Numerous editors at any given time are monitoring recent changes and edits to articles on their watchlist. The MediaWiki software that runs Wikipedia retains a history of all edits and changes, thus information added to Wikipedia never "vanishes". Discussion pages are an important resource on contentious topics. Therefore, serious researchers can often find a wide range of vigorously- or thoughtfully-advocated viewpoints not present in the consensus article. Like any source, information should be checked. A 2005 editorial by a BBC technology writer comments that these debates are probably symptomatic of new cultural learnings that are happening across all sources of information (including search engines and the media), namely "a better sense of how to evaluate information sources." Wikipedia, in common with many Web sites, makes its disclaimers highly visible; a practice that, at times, has led to commentators citing these in order to support a view that Wikipedia is unreliable. A selection of similar disclaimers from places which are often regarded as reliable (including sources such as Encyclopædia Britannica, Associated Press, and the Oxford English Dictionary) can be read and compared at Non-Wikipedia disclaimers. Wikipedia content advisories can also be found here. Wikipedia has robust version and reversion controls. This means that poor-quality edits or vandalism can quickly and easily be reversed or brought up to an appropriate standard by any other editor, so inexperienced editors cannot accidentally do permanent harm if they make a mistake in their editing. As there are many more editors intent improving articles than not, error-ridden articles are usually corrected promptly. Wikipedia:Manual of Style, which offers a style guide. These can be abbreviated to WP:NOT, WP:NPOV, WP:NOR, WP:V, WP:CITE, WP:MOS respectively. The Wikipedia community is largely self-organising, so that anyone may build a reputation as a competent editor and become involved in any role he/she may choose, subject to peer approval. Individuals often will choose to become involved in specialised tasks, such as reviewing articles at others' request, watching current edits for vandalism, watching newly created articles for quality control purposes, or similar roles. Editors who find that editorial administrator responsibility would benefit their ability to help the community may ask their peers in the community for agreement to undertake such roles; a structure which enforces meritocracy and communal standards of editorship and conduct. At present, around a 75–80% approval rating after enquiry is considered the requirement for such a role, a standard which tends to ensure a high level of experience, trust, and familiarity across a broad front of projects within Wikipedia. Wikipedia uses MediaWiki software, the open-source program used not only on Wikimedia projects but also on many other third-party Web sites. The hardware supporting the Wikimedia projects is based on almost one hundred servers in various hosting centers around the world. Full descriptions of these servers are available on this meta page. For technical information about Wikipedia, you can check Technical FAQs. Wikipedia publishes various types of metadata; and, across its pages, are many thousands of microformats. Wikipedia is run as a communal effort. It is a community project whose result is an encyclopedia. Feedback about content should, in the first instance, be raised on the discussion pages of those articles. You are invited to be bold and edit the pages yourself to add information or correct mistakes if you are knowledgeable and able to do so. Wikipedia:Help desk — Wikipedia's general help desk, if other pages have not answered your query. Wikipedia:Requested articles — to suggest or request articles for the future. This Wikipedia is written in English. Started in 2001, it currently contains 2,712,592 articles. Many other Wikipedias are available; some of the largest are listed below. Please note that while other sites may also use MediaWiki software and therefore look similar to Wikipedia, or may have a name that includes 'Wiki-' or '-pedia', or a similar domain name, the only projects which are part of the Wikimedia Foundation are those listed above, even if other projects claim to be part of it. ^ "Wikipedia announcements — May 2001". ^ "Wikipedia announcements — September 2001". ^ Bill Thompson, "What is it with Wikipedia? ", BBC, December 16, 2005. ^ The founder of Wikipedia is the sole individual empowered to override this process, but has stated in public that extreme circumstances aside, he will not do so. This page was last modified on 22 January 2009, at 11:12.